1906: The third Vanderbilt Cup Race was held, considered the most competitive in the series, featured 17 cars from France, USA, Germany and Italy. The field included several of best European drivers including; Vincenzo Lancia, Camille Jenatzy, Felice Nazzaro and Louis Wagner. The 10 laps of the 29.1 course made it the longest Vanderbilt Cup ever held on Long Island. 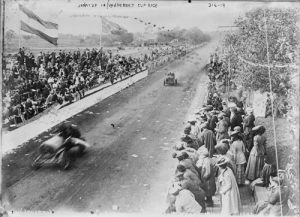 The race attracted a huge crowd estimated at 150,000 to 200,000. The victory of driver Louis Wagner and his riding mechanic Louis Vivet was the third consecutive win for France. Wagner called the race “certainly the most nerve-wrenching contest in motoring history,” and later wrote a magazine article about the horror of #racing through roads crowded with people. The finish of the race was marked by the use of a checkered flag for the first time. 1935: Antonio Brivio won the Coppa della Silla in Cosenza, Italy. This was the last win for the Alfa Romeo Tipo B. 1940: Frank Griswold, driving an Alfa Romeo, won the World’s Fair Ground Grand Prix staged on the exposition grounds in Flushing, New York, US. 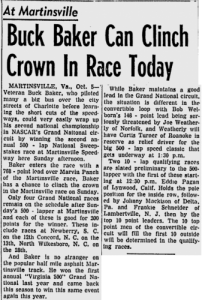 1957: Bob Welborn, with relief help from Possum Jones, won the Sweep­stakes 500 at Martinsville Speedway. Welborn’s convertible Chevrolet outran the 40-car field of sedans and convertibles. It was Welborn’s first #NASCAR Grand National win. 1962: Jack Brabham, in the second Formula 1 appearance with his new Brabham, finished 4th in the United States Grand Prix, becoming the first driver to earn championship points driving a car of his own design. 1968: British drivers Jackie Stewart, Graham Hill and John Surtees came first, second and third respectively, in the US Grand Prix at Watkins Glen, New York. 1973: At Watkins Glen, with Jackie Stewart having already clinched his third World Championship, Francois Cevert (29) was killed during Saturday morning qualifying, while battling for pole position with Ronnie Peterson. In the fast left-right uphill combination called “The Esses”, Cevert’s car was a little too far over towards the left side of the track, getting a bump from the kerbs. This made it swerve towards the right-hand side of the track, where it touched the track’s signature powder blue safety barriers causing it to spin and crash into the barriers on the other side of the track at a near 90° angle, uprooting and lifting the barrier. Cevert died instantly of massive injuries inflicted by the barrier, which cut his body in half between his neck and hip. 1974: Helmuth Koinigg (25) died in a crash in the 1974 United States Grand Prix, in only his second Grand Prix start. Running near the back in the US Grand Prix at Watkins Glen, Koinigg’s car suffered a suspension failure, pitching it head-on into the Armco barrier. The speed at which Koinigg crashed was relatively minor, and he ought to have escaped the scene uninjured. Unfortunately, as with a number of other circuits at that time, the Armco was insecurely installed and the bottom portion of it buckled as the vehicle struck it. The car passed underneath the top portion, which remained intact, decapitating Koinigg and killing him instantly. 1985: Nigel Mansell won his first Grand Prix, the European at Brands Hatch from third on the pole in a Wiliams-Honda. Ayrton Senna got pole position for the 6th time in the season for Lotus-Renault, averaging 140.106 mph (225.479 km/h), the first time anyone had lapped the circuit faster than 140 mph. Senna finished second with Mansell’s team-mate Keke Rosberg finishing third. 1991: Geoff Bodine’s extraordinary fuel mileage netted him a win in Char­lotte’s Mello Yello 500, Virginia (US). Bodine completed the final 114 miles without a pit stop. 2002: Dale Earnhardt Jr. out drove the field in a rare caution-free, fuel-mileage race at Talladega Superspeedway, winning the EA Sports 500 to extend his dominance at the 2.66-mile Alabama track. The victory was the third in a four-race Talladega win streak for Earnhardt, who led 56 of the 188 laps. Tony Stewart finished second, .118 seconds behind Earnhardt, to take the points lead from 30th-place Mark Martin. Stewart later went on to score the first of his three NASCAR Sprint Cup Series titles. Ricky Rudd came home third, followed by Kurt Busch and Jeff Green in the top five. 1906: Birmingham International Raceway, a 5/8-mile oval paved racetrack located at the Alabama State Fairgrounds in the Five Points West neighborhood of Birmingham, Alabama (US), hosted its first motorcycle race, followed by an automobile race three days later. 1907: A Walter driven by Joe Parkin Jr won the 10-mile race at the Trenton Inter-State Fairgrounds, New Jersey, US – this event hastened the evolution of the marque into Mercer. 1935: The Brooklands lap record of 143.44 mph was set by British driver John Cobb, driving his 24-litre, 500-bhp Napier Railton around the Surrey track. He also recorded the highest official speed on the track at 151.97 mph. 1935: The Wayland Grand Prix, the first race at the Wayland track near Boston, Massachusetts (US) and the first staged by the Automobile Racing Club of America (ARCA), was won by Langdon Quimby in a Willys 77. 1950: Spectators were allowed to watch racing at the former wartime airfield, Castle Combe in Wiltshire, where a crowd of 12,000 saw Peter Collins and Stirling Moss competing in F3. 1956: Fireball Roberts stormed from 14th starting position to lead the final 51 laps of a 200-lap main event at Newport (Tenn., US.) Speedway’s half-mile dirt track. The win was the sixth of Roberts’ 33-win career in NASCAR’s premier series. 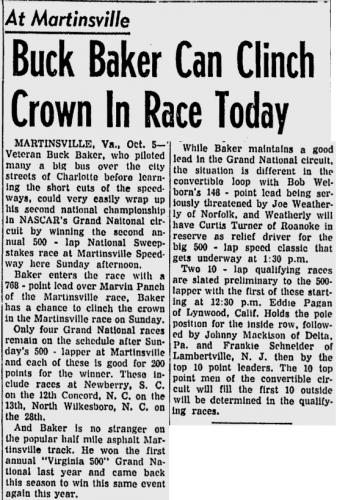 Buck Baker, a 2013 NASCAR Hall of Fame inductee, led the other 149 laps and finished second as the only other driver on the lead lap. Bill Amick, Roberts’ teammate in Pete DePaolo-owned Fords, placed one lap down in third. 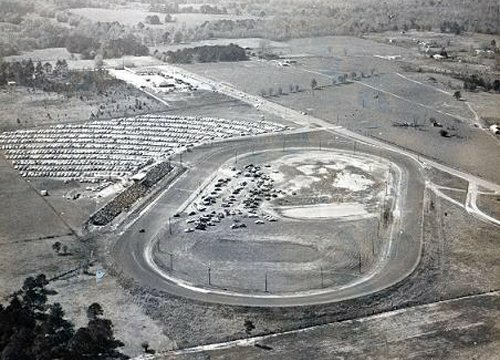 The track, 50 miles east of Knoxville, converted to a high-banked, .4-mile asphalt track in 1988 and still hosts weekly racing events. 1984: The European Grand Prix was the first major race was run on the new 4.54 km (2.82 mi) Nürburgring GP-Strecke and the first time F1 had returned to the ‘Ring since the 1976 German Grand Prix that was held on the old 22.835 km (14.19 mi) Nordschleife circuit. During the race morning warm-up session, Alain Prost spun his McLaren-TAG and hit a course car parked at the side of the circuit. Young Brazilian driver Ayrton Senna triggered a first corner accident which took out the cars of Rosberg, Marc Surer, Gerhard Berger, and Piercarlo Ghinzani. Senna’s Toleman (which had started 12th) had run into the back of Rosberg’s Williams under braking at the end of the main straight which caused the accident. Rosberg had started fourth (after blowing his Honda engine coming out of the final corner of his qualifying lap), but was slow off the line as his engine had suddenly developed a misfire. After qualifying second on the grid, Alain Prost won the race in his McLaren from the Ferrari of Michele Alboreto and the Brabham-BMW of defending World Champion Nelson Piquet, with both the Ferrari and Brabham running out of fuel as they crossed the finish line. When they got out of their cars which stopped at the pit exit, Alboreto and Piquet raised their arms to each other in a gesture of frustration at FISAs 220 litre fuel limit for turbos which had reduced races to economy runs. Niki Lauda, who had almost lost his life in a fiery crash while driving a Ferrari 312T2 during the 1976 German GP, started 15th and finished 4th in his McLaren, which could have been 3rd had it not been for a spin when he locked his brakes while lapping Mauro Baldi on lap 21. In stark contrast to the lack of safety of the Nordschleife, Lauda gave the new GP-Strecke the thumbs up as a very safe Grand Prix circuit, saying that it was “the perfect place to hold a Grand Prix”. He also added that returning to the ‘Ring held no fears for him as his accident was 8 years previous and if he had not gotten over it by then he never would. 1995: Racer Louis Meyer (91), died in Las Vegas, Nevada, US. Meyer was first-ever driver to win the Indianapolis 500 three times, capturing the prestigious race as a rookie starter in 1928 (though having driven as a relief driver for Wilbur Shaw the year before), then again in 1933 and 1936. Meyer started the tradition of drinking milk (buttermilk at the time) in victory lane at the 1933 Indianapolis 500 race, when he drank a glass of milk. Following his 1936 Indianapolis 500 victory, he drank from a glass milk bottle instead, as most race winners have done since. Following the suggestion of former race winner, Tommy Milton, that year he became the first driver to receive the Pace Car as part of the race winnings. Meyer won the United States National Driving Championship in 1928, 1929 and 1933.Meyer’s wife June did not even know he was racing in the 1928 Indianapolis 500. Earlier in the day she was in Pennsylvania picking up a wrecked car and after that went to see her brother-in-law Eddie Meyer race in Reading. She found out about her husband’s victory after the track announcer in Reading asked the crowd to give a big hand to Eddie Meyer, the brother of the Indianapolis 500 winner. 2001: Gil de Ferran won the CART Texaco Grand Prix of Houston through the downtown streets of Houston, Texas, US.